A businesss owner attempts to rescue his kidnapped brother. If it’s Thursday, it must be time for another direct-to-video movie in which Nicolas Cage sports a terrible wig. Through their lives, brothers Mikey Johnathan Schaech) and JP (Adrian Grenier) Lindell find themselves able to rely on no one but themselves. As adults, the Lindell boys follow different paths. While JP finds success as the owner/operator of a construction business, Mikey engages in a life of petty crime. 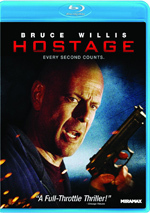 Mikey’s choices haunt him when forces headed by crime boss Eddie King (Cage) apparently kidnap him. Along with detective friend Sal (John Cusack), JP attempts to find his brother. No one will call that a particularly original narrative concept, especially because Arsenal fails to explore characters terribly well. It uses a cliché theme of the responsible brother and his ne’er-do-well sibling without investment or originality. That covers the rest of the movie as well, though I guess I could call it “creative” that this action flick comes free from almost all thrills and passion. From start to finish, Arsenal doles out the requisite violence but it never manages to give us anything even vaguely exciting or compelling. Instead, it plods from one dull scene to another, all of which limp across the screen. Even potentially thrilling pieces like a big car chase come across as flat and uneventful, so everything here proceeds without much life. Don’t expect the actors to redeem matters. Always an over the top actor, Cage hams it up big-time as the crime boss. Cage goes nuts with unrealistic technique and provides a laughably awful performance. On the other side, Grenier underplays to an extreme. He seems flat and emotionless, tendencies that don’t work for a character driven by familial passion. Not that the story manages to prompt much potential drama, as the scattered narrative fails to muster much momentum. Arsenal flails across its 92 minutes and can’t turn into a tale with any drama or intrigue. All of this adds up to a pretty rotten movie. Arsenal offers the sight of actors slumming in a pointless, dull attempt at a thriller. Arsenal appears in an aspect ratio of approximately 2.40:1 on this Blu-ray Disc. This turned into a positive presentation. Sharpness worked fine. The occasional slightly soft wider shot emerged, but I felt the majority of the movie offered nice clarity. No issues with jaggies or moiré effects materialized, and edge haloes were absent. Source flaws failed to become a factor here. In terms of palette, Arsenal went with a stylized look. In an unsurprising move, the film emphasized orange and teal to a substantial degree. Those tones seemed acceptable given their limitations. When I examined the DTS-HD MA 5.1 soundtrack of Arsenal, I thought it was moderately active and involving, as the mix used music and atmosphere to nice advantage. These elements created a good sense of place and movement that brought us an engaging soundscape, with the best material found in the smattering of action sequences. Audio quality was fine. Speech was reasonably crisp and natural, and effects showed good punch. Music was also clear and full. The soundtrack didn’t excel but it connected with the story in an appropriate manner. As we move to extras, we open with an audio commentary from director Steven C. Miller and actor Johnathan Schaech. Both of them sit together for this running, screen-specific look at story/characters, cast and performances, sets and locations, action and stunts, music, and related areas. Miller and Schaech provide an enthusiastic but not especially informative chat. While they cover the basics in a reasonable manner, they never give us a ton of insights. That means we find an occasionally useful but mostly forgettable commentary. 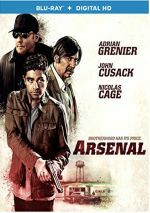 A featurette called Building an Arsenal spans nine minutes, 47 seconds and involves Miller, Schaech, director of photography Brandon Cox, and actors Lydia Hull and Adrian Grenier. “Building” covers story/characters, cast and performances, and Miller’s impact as director. Very little substance emerges in this praise-packed promo program. We also get a collection of Extended Cast/Crew Interviews. In this compilation, we hear from Grenier (4:31), Schaech (5:05), Hull (4:08), Miller (3:43) and Cox (9:13). These cover the same topics as “Building”, though we also hear a little about locations, shooting schedule, and cinematography. All three of the actor interviews offer little to no useful material, so one can safely skip them. Miller doesn’t tell us much I’d call new, but he throws out some minor tidbits at least. Cox becomes the only participant to provide actual quality information. The disc opens with ads for Solace, Imperium, Urge, The Prince and Marauders. We also get a trailer for Arsenal. Slow-moving and directionless, Arsenal never builds a head of steam. Saddled with bad acting and poor stabs at action, the movie goes nowhere. The Blu-ray provides largely good picture and audio as well as mediocre supplements. Arsenal flops.